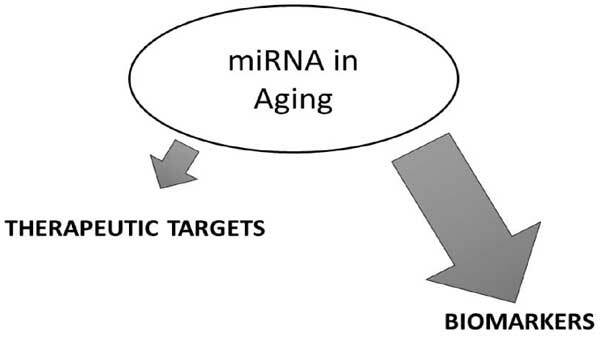 MicroRNAs and Aging: Biomarkers or Therapeutic Targets? Understanding the molecular mechanism of aging is of utmost importance to the scientific communities. To date, various theories have been proposed and many of them were evaluated as potential targets in the battle against aging. MicroRNAs, the universal gene expression regulators, were found to be associated with the aging process as many of them have been linked to biological process associated with cellular deterioration. In this short report, we briefly review the contribution of miRNAs to the aging process and offer an opinion as to how the knowledge of the role of these molecules in aging can be utilized. Keywords: Aging, biomarkers, miRNA, therapeutic targets. Title:MicroRNAs and Aging: Biomarkers or Therapeutic Targets? Keywords:Aging, biomarkers, miRNA, therapeutic targets. Abstract:Understanding the molecular mechanism of aging is of utmost importance to the scientific communities. To date, various theories have been proposed and many of them were evaluated as potential targets in the battle against aging. MicroRNAs, the universal gene expression regulators, were found to be associated with the aging process as many of them have been linked to biological process associated with cellular deterioration. In this short report, we briefly review the contribution of miRNAs to the aging process and offer an opinion as to how the knowledge of the role of these molecules in aging can be utilized.